I just couldn’t wait for the European release next year, so I spent the last month memorising Japanese Pokémon names and diving into the import version of Pokémon Super Mystery Dungeon. The following are my impressions after playing through the main storyline, although there seems to be a massive amount of stuff to do after the credits. Don’t worry, I’ll keep it spoiler-free in posting my thoughts on the Japanese version of Pokémon Super Mystery Dungeon. Yes, not the one that that’s being released in America – I can’t stress that enough. Ain’t no embargos being broken here. 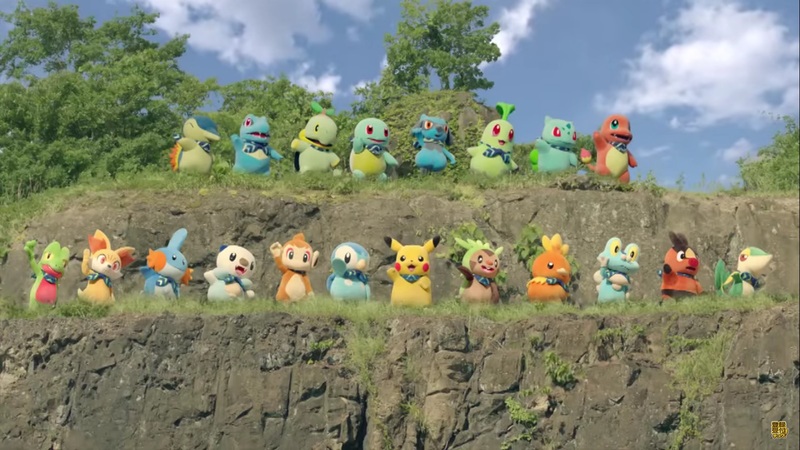 In true Pokémon style, the game kicks off with picking a starter Pokémon, which is here determined by a short personality quiz. The answers you give influence both what Pokémon you start out playing as and the partner that accompanies you, but if you disagree with the game’s decision you can freely pick your characters from each generation’s set of starter Pokemon (plus Riolu!). Personally I picked Squirtle and Turtwig and took Team Turtle through the game at a leisurely pace. 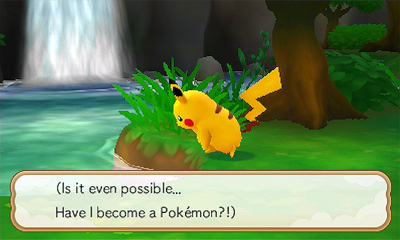 As is typical for the Pokémon Mystery Dungeon series, you play as a human that finds themselves turned into a Pokemon and much of the game’s story is spent uncovering the mystery behind how you wound up in this foreign place and why Pokémon all over the world are suddenly being turned to stone. Without spoiling anything, the plot does get completely crazy in the last third of the game, but it’s a slow buildup that takes a lot of time to get interesting. 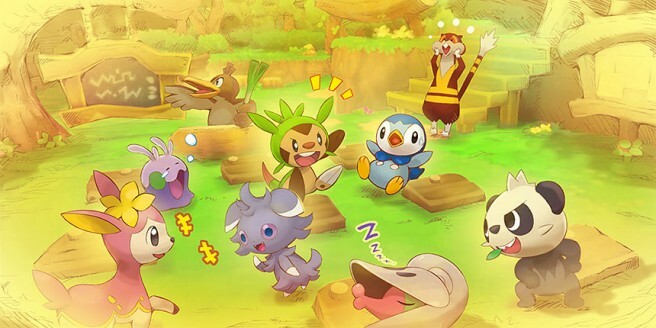 The early stages of Pokémon Super Mystery Dungeon are set at a sleepy village and involve a bunch of odd jobs in simple dungeons to ease players into the gameplay mechanics. It’s not a particularly exciting start, especially for returning players, and it isn’t helped by the lengthy cutscenes. There were a few points where the game would go “hey, you’ve been playing for a while, why not take a break?” before I even ventured into a dungeon. It takes a long time to leave Tutorial Town, but after that the game really opens up with different regions to explore, all of which appear to be taken from the previous Pokémon Mystery Dungeon games. The game also gives you access to the Connection Orb, a massive network of Pokemon with dungeon-diving missions to give you. There are several points where you can only advance the story by doing side-quests, but this isn’t necessarily a bad thing as these quests are varied and tend to have worthwhile rewards. In addition to boosting your team’s ranking, which unlocks new dungeons and legendary Pokémon to pursue, completing quests is the main way you’ll recruit Pokémon in Super Mystery Dungeon. Yes, the old method of hoping that Pokémon found in dungeons will join you after you smash their face in is gone and the game is much better for it. Now Pokémon will join you once you complete their requests to, say, rescue their fallen friends in a dungeon or defeat them in battle. Some Pokémon might also team up with you if you encounter them while exploring or even if you just chat to them in town. This allows players to quickly build up a massive team of Pokémon to take into dungeons, which is a must since the game now includes all 720 creatures (Volcanion? Who’s that?). Having a huge range of elements and moves to draw from is helpful for tackling tougher dungeons, although disappointingly most areas only allow you to form parties of three Pokémon, one of the few steps back from previous entries. One problematic aspect of the Connection Orb is that it gives you access to powerful fully-evolved Pokemon and legendary creatures very early on. For instance, I managed to recruit a high-level Salamence within the first few hours, although it didn’t end up being the game-breaker I initially thought. There are restrictions on when powerful Pokemon can be used with teammates at higher levels unavailable for a few dungeons after they’ve been deployed. They also can’t tag along on story-related dungeon crawls, which keeps the difficulty curve reasonably consistent. Besides, because of the way the mechanics work compared to other Pokémon games, having higher stats doesn’t matter too much; it’s more about the items you bring along and careful positioning that brute force. 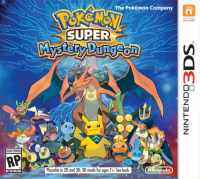 Mechanically speaking, the core gameplay in Pokémon Super Mystery Dungeon is very similar to the previous games and Chunsoft’s overarching Mystery Dungeon series. Your team of Pokémon explore vast randomly generated dungeons, with each floor filled with unfriendly foes and a range of items to pick up and utilise. 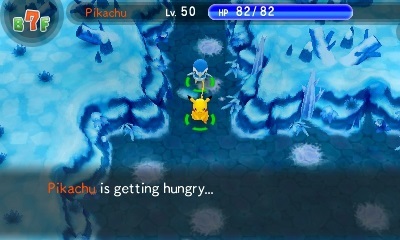 Super Mystery Dungeon brings back the hunger mechanic where your Pokémon gradually grow hungry as they explore the dungeon; a portion of the hunger gauge can now be spent to unleash powerful team attacks that spread your team out around an enemy Pokémon and ignore type resistances. There are a number of new items including “emera” – multicoloured gems that are littered around dungeons and provide a number of bonuses when equipped. These effects can be anything from automatically reviving your Pokémon to nullifying ailments to randomly doubling up attacks. They’re all useful and since the stones disappear when leaving the dungeon there’s some incentive to explore every room and pick them up before they explode into dust. Disappointingly, a number of the new mechanics detailed prior to the game’s release aren’t actually available until the post-game. Mega Evolution, which has featured heavily in the last few Pokémon games, can’t be used until after the credits roll, and even then it’s dependent on finding a special emera that appears randomly in dungeons. The Pokemon Hoopa can also be summoned from a special lamp item and calls in random legendary Pokemon to help (or hinder) players. It’s a fun inclusion, but again you won’t be seeing it throughout the main storyline. While relegating these features to the post-game makes sense since it potentially lets players trivialise the difficulty, just know that some of the primary selling points of the game aren’t available from the get-go. 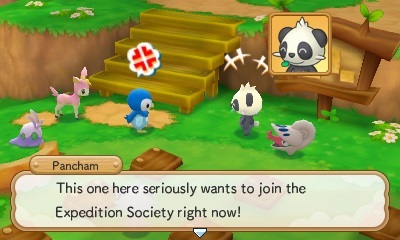 The element of randomness is still very much present in Pokémon Super Mystery Dungeon, but it’s quite a forgiving game. Special seeds that revive fallen party members are plentiful and the addition of new multi-use “staves” let any Pokémon attack from a distance. Even if you fall in battle there’s a rescue request feature that lets other players embark on a quest to save your party through a code or streetpass. There’s no Miiverse integration built into the game, but you can take a screenshot of the code and post it on Miiverse in the hope that someone will rescue you. 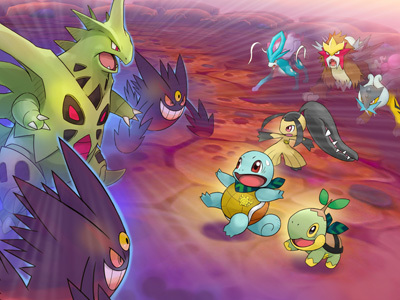 Pokémon Super Mystery Dungeon is unlikely to convert those who disliked the core gameplay in earlier Mystery Dungeon games, but it works more effectively with the Pokemon license this time around, giving you a wide variety of Pokémon to use. It has the same charm as the main series too – there’s nothing amazing about the writing, but the way each Pokémon is characterised through dialogue is cute. There are still elements of the two series that fit together a bit awkwardly (the boss fights aren’t much fun), and I’m sure Mystery Dungeon purists will find it a bit too easy, but I’m impressed by the game so far and it should be worth checking out the English version when it comes out. Plug time – I’ve been writing more about Pokémon Super Mystery Dungeon and other cool JRPGs at my new website, JRPG.moe. You can find impressions of other 3DS titles like 7th Dragon III and Project X Zone 2 there and I have a more complete review of Pokemon Super Mystery Dungeon in the works, so please keep an eye on the site for that. If you have questions on the game, let me know in the comments and I’ll try and answer them!